Today (January 15th, 2018) is #BlueMonday. It’s the date that, based on factors like the weather, debt and generally low levels of motivation, has been deemed the most depressing day of the year. Originally it was a PR invention but now it’s seen as something of an annual event. Complete with its own hashtag! Since it has no basis in scientific research, we’re choosing to ignore its negative undertones and use it to highlight an uplifting new staircase that we recently created for a very happy customer. In 2017, Mr Ashton approached us to create a stylish new wood and glass staircase for his home. 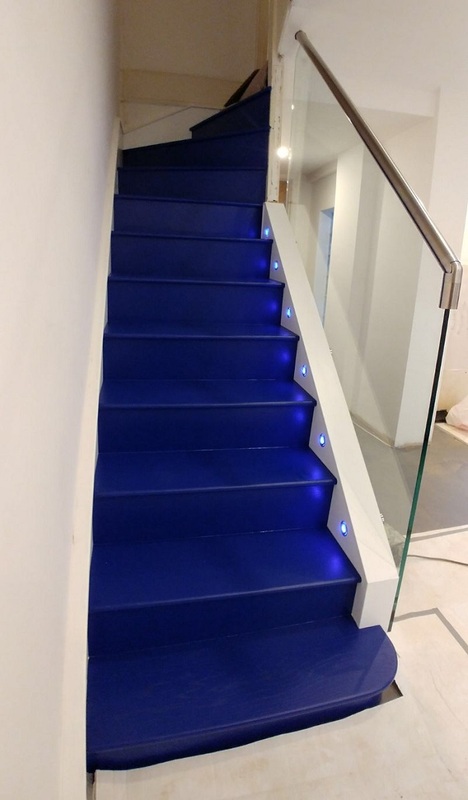 At Jarrods, we pride ourselves on designing and installing truly bespoke staircases. We take the time to find out exactly what our customers want and create a staircase design that matches it. In many cases, people choose us because they’ve been told elsewhere that something can’t be done. Whereas we will always go out of our way to find a way to give someone exactly what they want. Mr Ashton wanted the minimally clean lines of a crisp, white wooden staircase with a contemporary glass panel and metal handrail. 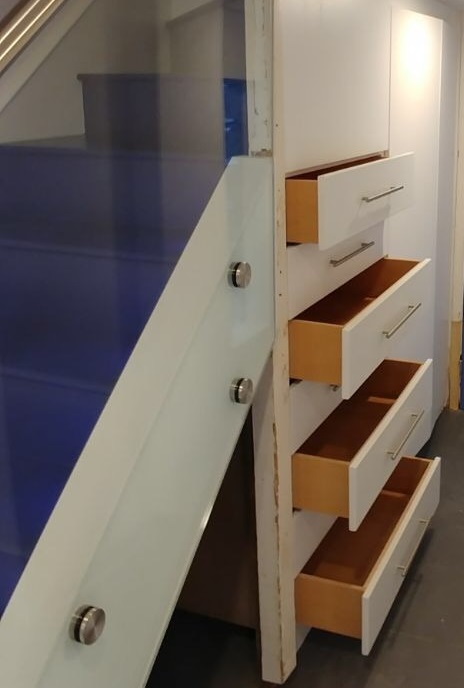 He also wanted under-stair storage and stylish stair lighting to complete the staircase he’d always wanted. As with all clients, we offer a selection of finishes for wooden stair treads. 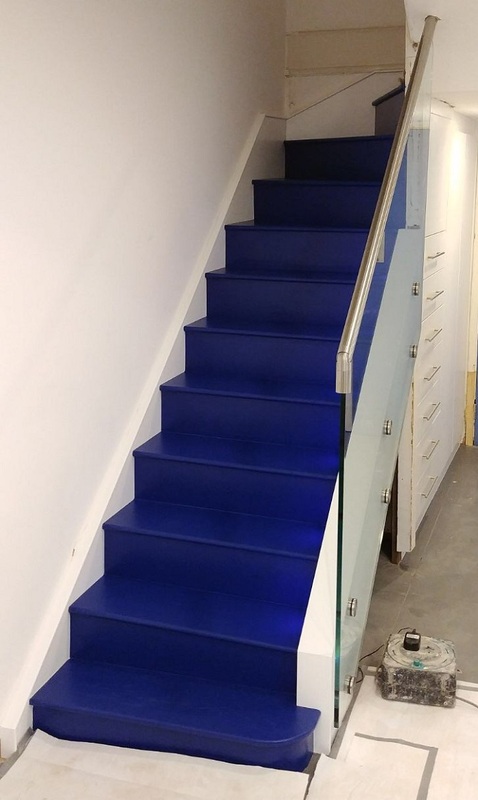 In this case, Mr Ashton was the first of our customers to choose a vibrant blue stain, creating this inspiring blue staircase design. I’m sure you’ll agree, it turns a stylish staircase into an impressively imposing statement piece. On this supposedly depressing date, on behalf of Mr Ashton, we wanted to add a bit of colour and joy to #BlueMonday. If you’ve always pictured your perfect staircase, but you never thought it was possible, the team at Jarrods see it as a personal challenge to make it a reality. Contact us today and tell us what you’ve always wanted. We’re confident that we can bring it to life.